The word tire refers to something you wrap around a wheel to keep it from wearing out. The first tires were metal bands on wood spoke wheels. John Boyd Dunlop invented the pneumatic rubber tire in 1888. An Englishman named Palmer developed the single cord tire in 1900. Bias-ply tires followed next. In 1946, Michelin patented a radial tire design developed in conjunction with Citroen for its front-wheel-drive cars. In a radial, the ply cords radiate straight up from the tire bead to the opposite bead and are reinforced by a belt of steel fabric that runs the circumference of the tire. The Michelin "X" radial went on sale in 1949. Tire plants here were set up to make bias-ply tires. A huge investment was required to change, so the switch to radials was done incrementally. As the '60s progressed, so did the horsepower race that started in the mid-'50s. Wider tread footprints were required for the new "performance car" platforms and more aggressive power train options that were being developed in ever-larger numbers. 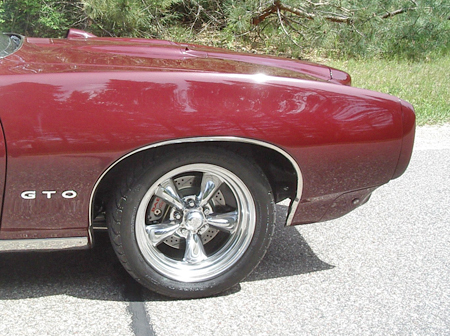 Fat 70- and 60-series tires became the standard OEM fitment for almost all of the muscle cars. The development of wide base tires finally culminated with bias-belted construction. The use of two plies of polyester combined with two circumferential belts of fiberglass provided customers with the best in street performance available at the time. The next step was the radial tire. Radial tires greatly improve the ride of vintage muscle cars. 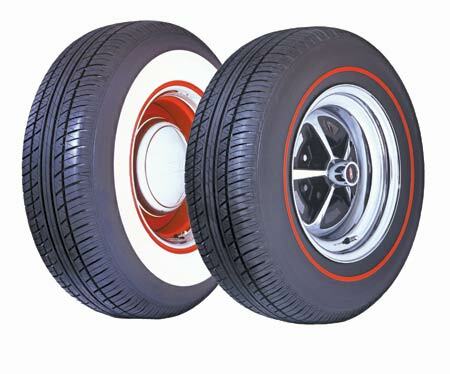 These tires are marketed by Diamond Back Classics, which sells only radials including red stripe and whitewall styles. Sears Roebuck Company made a deal with Michelin that transformed the American tire industry. Due to volume production efficiencies, the radial tires that Sears sold here weren't that expensive and they gave 40,000 miles of service at a time when bias ply tires got about 15,000 miles. Sears sold countless millions of the tires. They were even put on earlier cars of the day and worked perfectly. Most people today have never driven on bias tires. They are used to radial construction in conjunction with a highly designed radial suspension featuring concepts designed to provide you with a smooth ride in a vehicle 1500 lbs. lighter than your father's Oldsmobile. The radial tire is a component of such designs. 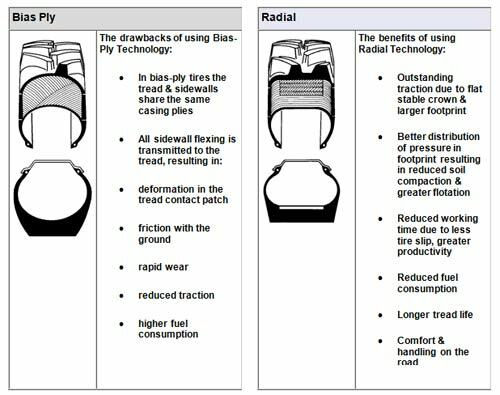 This table compares the features and benefits of bias-ply tires and radial-ply tires. (Courtesty Michelin Tire). The carcass of a tire is made up of layers of rubber-permeated fabric called plies. The fabric is usually polyester. The plies on a bias tire run approximately 45 degrees to the centerline of the tread, alternating in direction with each layer. They crisscross at 90 degrees to each other.Â The plies on a radial run 90 degrees to the centerline and overlap instead of crisscross. 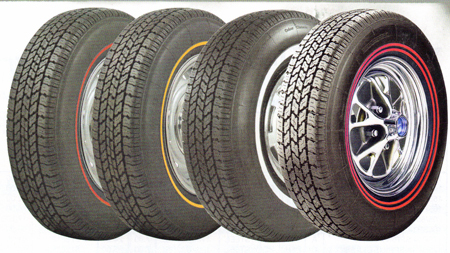 The design of a radial tire allows the sidewall of the tire to be more "flexible." This characteristic reduces rolling resistance, providing better gas mileage and longer tread life. This "flex" gives the radial tire a bigger "footprint" on the road so it grips better and enhances both wet and dry handling. 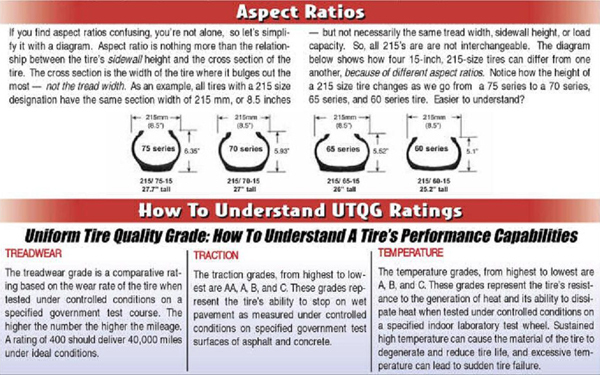 The aspect ratio — relationship of the height and width of the tire cavity — is another advantage of radials.Â Early tires were round and had a 100 percent aspect ratio. 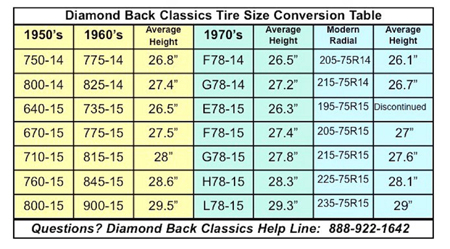 Later bias ply tires had an 82 aspect ratio (cavity height 82 percent of width).Â Lower profile 60, 78 and 70 series tires had wider footprints and shorter sidewalls.These factors produced a firmer ride and more responsive handling.Â Radial tires have an even shorter, wider profile and better performance. As the aspect ratios decreased, tire makers used belts layered under the treads to provide better tread face integrity.Â These were originally "fiberglass" belts, but steel mesh belts were used later. Belted bias ply tires were used in the '60s, particularly on muscle cars, but now we think of steel belted tires as radials. The advantages of radials include better gas mileage, improved traction, better distribution of pressure in the footprint, less tire slip, longer tread life, greater resistance to tread cuts and greater heat resistance. "An enthusiast drives his car on radials, instead of the car driving him," expert Corky Coker says. Muscle car fans frequently talk about the different types of tires and how they "work" on different older cars. Classic fans prefer the look of bias plys and are used to the way they perform. Some say their cars only have the right stance and ride height with bias ply tires. Others think that bias ply tires are better for old wheel rims. Due to past problems, some owners feel that radial whitewalls turn yellow and bias ply whitewalls are best. This is no longer true, however. The radial whitewalls have been improved and no longer have discoloration issues. At high speeds the radial tires will track better and prevent a '50s or '70s Resto-Mod from wandering or "following" cracks or waviness in the surface of a road. With radials on such cars you should run a minimum of 35-45 psi air pressure instead of following the owner's manual, according to tire maker Corky Coker. "This will also help when it comes to steering," Coker added. One visit to the SEMA Show in Las Vegas is enough to convince any Resto-Mod fan that great-looking tires and wheels come in all shapes, sizes and styles. After one pass through the SEMA Tire Hall, you'll admit that even the polar opposite of your favorite tire looks really kool when it's done properly. That's because the world's best Resto-Mod builders exhibit at SEMA and like the artists that they are, each has his or her personal style of crafting a show car. From the latest Foosemobile featuring 22-in. rims with "just-barely" rubber to ride on all the way up to the black "Starship Enterprise" Corvette customs in Barry Meguiar's indoor booth, you'll see the nation's top Resto-Mods at SEMA. And they will be wearing the best in "automotive footwear" at all corners of the car. Here's some cool Resto-Mod tire and wheel choices from SEMA. Â A new Coker Classic G78-15 bias-ply tire features a 3-1/4-in. white sidewall that's perfect for vintage Resto-Mods like Tri-Five Chevys. This tire is built to original equipment specs and the extra wide white sidewall is the perfect answer for modern kustomizers who want that genuine 1950s look. Call (800) 251-6336 or visit www.cokertire.com for more info. Some Resto-Mod builders want that competition look. Summitt Racing stocks Goodyear Eagle Dragway Special Slicks and other racing tires that look great. The bold yellow "Goodyear" lettering is an attention getter. A typical model is the 30 x 12.5-15 Bias-Ply with D-5 compound. Contact Summitt Racing at (800) 230-3030 or visit www.SummittRacing.com. Kelsey Tire Co. markets an L60-15 Polyglas GT raised white letter tire that's been long awaited by owners of '69 Shelbys, Boss 302 and Boss 429 Mustangs, Buick Grand Sports, Mopar Daytona and Superbird models, '70 Camaro Z28s and HEMIs. Back in the day, if you knew how to "fly" on four wheels, 60 Series Goodyear Polyglas GTs were the hot ticket. As you might suspect, customs rods built in that era adopted these tires, too. Specs for the Kelsey tire include a 7-in. rim width, 10.6-in. section width, a 27.87-in. overall diameter and a 9.25-in. tread width. 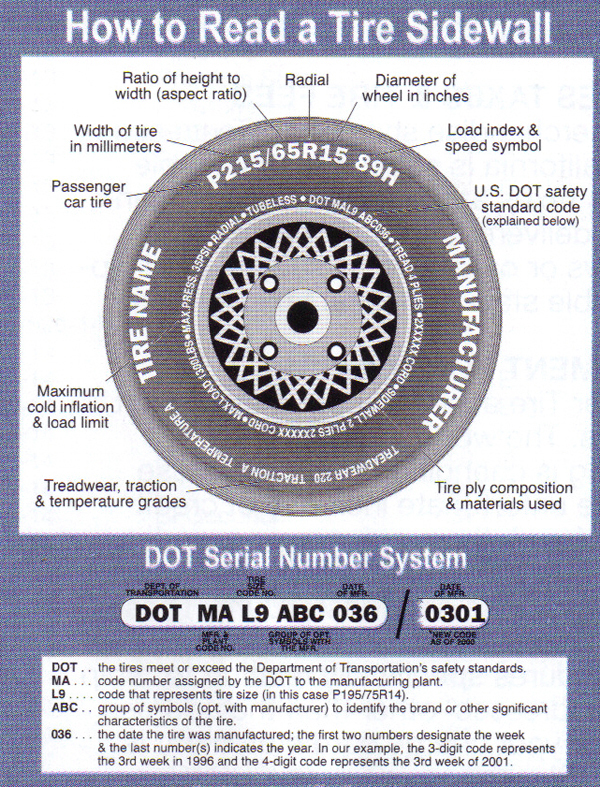 On the sidewall the model name and size of the tire is elevated in small solid raised white letters and numerals. For info dial (800) 325-0091 or email kelsey@kelseytire.com. Pirelli's on a Resto-Mod? Leave it to Chip Foose! Italy's Pirelli Tires (www.us.pirelli.com) and American kustomizer Chip Foose have been building a Resto-Mod relationship. Foose showed the '70 Plymouth "Terracuda" at the SEMA show wearing a set of Pirelli tires and Foose-designed wheels. The Foose wheels were painted gold to match the car's special Terracuda Brown with Gold stripes color scheme. While you may not have a Terracuda in your garage, other Foose wheels—manufactured by MHT Wheels—are available. Visit www.chipfoose.com to see his line or contact MHT Wheels at Â (800) 493.7891Â or www.mhtwheels.com. Specialty Wheel Company manufactures several styles of wire wheels, but its 1950s-style Cadillac clone wire wheel has become a favorite of Resto-Mod builders. Available in 15 x 6- and 16 x 6-in. sizes, the chrome-plated wire wheels feature 48 spokes and a 5-on-5-in. bolt pattern. Specialty Wheel can build wheels with custom backspacing and it can also provide the appropriate center caps, lug nuts and valve stems to finish off the combination. Call Specialty Wheel at (800) 959-5800 or drop in at www.specialtywheel.com. Weld Rodlite 14 x 6-in. wheels feature an innovative new Resto-Mod design that shows traces of classic wheels of the past. They are precision crafted from cold forged aluminum polished to a brilliant finish. These wheels accommodate tubeless mountings. A push-through center cap is included with each wheel. They come with centers drilled for 4-1/2-in. (Ford) and 4-3/4-in. (GM) bolt patterns. Hex and 3-bar knockoff center covers are separately available. 3 bar knockoffs are sold in sets of four. The cover that conceals the lug nuts has a 6-1/8-in. inside diameter and 6-1/4-in. outside diameter. The Tri-Bar knockoff has a 4-1/2-in. inside diameter from center to end of bar. Contact Speedway Motors by calling (800) 979-0122 or visiting www.speedwaymotors.com. Bob Ida loves talking about building his company's own line of wheels for Resto-Mods. Rob Ida Concepts LLC will actually create and custom build wheels for yourÂ special Resto-Mod project. If your vehicle demands a custom set of one-off wheels that no one else can have, give the Morganville, N.J. company a call. Their motto is, "Your design or ours . . . when only the best will do, giveÂ us a call." The phone number is (732) 591-1245 or you can send a personal email toÂ Rob Ida, President/Designer/Head Fabricator at rob@robidaconcepts.com. Heavily promoted at Muscle Car and Corvette Nationals were the Resto-Mod wheels being marketed by the enthusiasts who are reviving one of the Windy City's best-known high-performance brands. Mr. Norm was a high-performance Mopar dealer in Chicago who was legendary for providing hot rodders with the parts and cars they need to drag race. The Mr. Norm wheels are available in 17- to 20-in. sizes. Different powder coated centers are $85 per wheel. Contact Mr. Norm's Garage- Chicago by calling (815) 986-0270. Or visit the company's Website at www.mrnormsgarage.com. With years of success in motor sports, BBS provides the highest level of wheel technology to racers and then applies its experience to Resto-Mod builders. BBS took its first steps into the world of racing over 30 years ago and has since developed increasingly lighter weight wheels. Race-wining wheels combine minimum weight and maximum safety. A lightweight wheel also improves the driving characteristics of a Resto-Mod and saves fuel. BBS wheel designs are so highly regarded that Goodyear used the BBS CK Silver model to display its Eagle Performance Radial tires on at the SEMA Show. BBS wheels are available from Tire Rack (888) 541-1777. Many companies around the country build special Resto-Mods to serve as SEMA show cars. Lenso created a set of special wheels for the event. The "Roulette Wheel" rims seemed to fit in perfectly at the Las Vegas venue. They featured Lady Luck's favorite black and red numbers around the outer edge and Louis Vuitton leather finish in the center. The luxury wheel company's name is spelled out in Sin City style rhinestones. Super Buy Tires sells Lenso wheels in the U.S. though we can't guarantee that they regularly stock this made-for-SEMA model. Of course, you can call them at (562) 630-5848. Maybe you'll get lucky. Billet Specialties offers 90 plus wheel styles in a diverse product line that's growing daily. The company has sold wheels to rod and Resto-Mod builders for 25 years. Manufacturing wheels isn't a hobby at Billet Specialties. The company's customer service staff consists of automotive enthusiasts that understand current trends and customers' needs. The staff provides technical advice, application info and possible solutions for special needs via phone or e-mail. Contact Billet Specialties at (800) 245-5382 or www.billetspecialties.com. Resto-Mod builders have a place in their heart for the Pontiac 8-Lug rims and Buick aluminum wheels that were factory options in the 1960s. J & G Relining, of McHenry, Ill., is the only company currently offering a 3-step process to install new cast iron liners into these GM factory-issued Pontiac and Buick aluminum hubs and drums. To protect the safety of its customers, the company installs cast iron liners just like the factory supplied when these wheels were brand new. J & G also buys and sells unrestored original Pontiac 8-lugs and Buick aluminum wheels. Call (815) 276-2578. With over 50 different hubcaps and accessories and 100-plus wheel styles, Wheel Vintiques has become the "wheel deal" for Resto-Mods. The 17-year-old company offers the largest selection of stock steel wheels, billet wheels, wire wheels and accessories. Wheel Vintiques stresses quality control. Every part it sells is inspected for fit and finish in each phase of production. It inventories an enormous number of wheel centers, rim shells and center blanks waiting to fulfill orders and keeps an inventory of finished wheels in select styles and sizes ready for immediate shipping. For information on these and other Wheel Vintiques products call (559) 251-6957 or visit www.wheelvintiques.com. In the late '50s, when European racing wheel companies were focused on semi-solid modular designs, designer Tom Griffith conceived the tapered parabolic contour spoked American Racing "Torq Thrust®" which reduced wheel weight and promoted brake cooling. Considered by many to be the most famous wheel of all time, the Torq Thrust® started the custom wheel craze, making the conversion from strip to street. Today, authentic "old school" Torq Thrusts are highly collectible and sold around the world. The Torq Thrust® is the signature wheel for Resto-Mods, but American Racing also has a neat Vintage Series featuring Shelby Cobra models and others. Visit www.americanracing.com. Before selecting a setÂ of aftermarket wheels for a Resto-Mod, several factors have to be considered to get proper fitments. 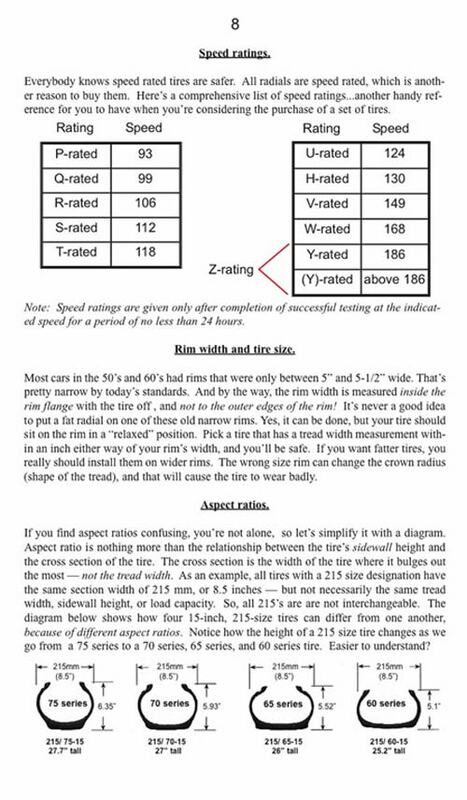 For a proper fit, the wheel supplier will need these specifications. They include wheel diameter, wheel width, wheel center, wheel offset, backspacing, centerbore and bolt circle. Stock modern rims generally come in 15-, 16- and 17-inch diameters. This dimension is usually measured in round inches, but there are some unusual 16.5-inch size wheels. The widths of different wheels usually vary in one-half inch increments and many are between seven and eight inches wide. A wheel's centerline is defined as its midpoint in relation to its width. In other words, the centerline of an eight inch wheel would be four inches in from each side. Offset is the distance from a wheel's hub mounting surface to the centerline. Offset is measured in millimeters. If a wheel has zero offset, the hub mounting surface is even with the centerline. If a wheel has positive offset, the hub mounting surface is toward the front or wheel side. Positive offset wheels are used on front-wheel-drive vehicles and newer rear-wheel-drive cars. If the wheel has negative offset, it's the opposite. "Deep dish" wheels have negative offset. If offset is incorrect for a car, handling suffers. When the width of a wheel changes, its offset usually changes or the added width is equal on both sides of center. This is rare situation and won't occur very often in reguar production cars. 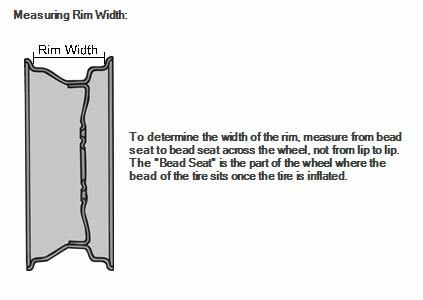 The distance from the mounting surface to the insideÂ lip of theÂ wheel is its backspacing, which has a relationship to offset as follows: backspacing equals approximately half the wheel width plus the offset plus about a quarter inch. Centerbore refers to the mounting holer on the back of the wheel that centers it on the spindle. This hole is machined to exactly match the spindle so that the wheel is automatically mounted in a specific position and won't vibrate. The bolt pattern is the diameter of a circle through the center of the bolt holes. Jeff has 17-inch Vintage Wheel Works V-40 Straight Spokes on 17 x 7-in. wheels with 3-3/4 in. backspacing and P225/45R17 Goodyear F1s. At the rear he has 17 x 9-in. wheels with 5-1/2-in. backspacing and P255/45R17 Goodyear F1s. Jeff Noll wanted to avoid "Foose" type shiny chrome or aluminum rims when it came time to select rims for his '67 Camaro. He stayed with 17-inch wheels as a happy medium. His choice was Vintage Wheel Works V-40 Straight Spokes. He ordered them direct from the California company and felt that they were more of a road course style wheel in appearance. Jeff made custom Super Sport (SS) wheel centers himself by purchasing plain steel center covers from Vintage Wheel Works, painting them to match, and adding the SS logo emblems. As mentioned, for his tire choices, up front, Jeff mounted 17 x 7-in. wheels with 3-3/4 in. backspacing and P225/45R17 Goodyear F1 tires. On the rear he used 17 x 9-in. wheels with 5-1/2-in. backspacing and P255/45R17 Goodyear F1s. The GTO has chrome 17 x 7-inch five-spoke American Racing TorqThrust II front wheels with 245/45 B. F. Goodrich G-Force tires. The rear setup has 17 x 9.5-inch five-spoke TorqThrust IIs and 285/40 B.F. Goodrich G-Force tires. At the front of his '69 GTO ragtop, Jim Mokwa installed a set of chrome 17 x 7-inch five-spoke American Racing TorqThrust II wheels shod with 245/45 B. F. Goodrich G-Force tires. His rear setup had a somewhat similar look with slightly larger 17 x 9.5-inch five-spoke TorqThrust II wheels from American Racing and 285/40 B.F. Goodrich G-Force tires. They also have chrome center caps.